Details of achievements of our engineers are described below. (NOTE: Achievements are not necessarily of our company but of each engineer of past activities). 1. Independent Component Analysis, technological survey and lecture. 2. Change Point Detection of Time Series, technological survey. 4. Periodic Impulse Waveform Extraction, technological survey and implementation. 5. Order Tracking of Machine Vibration by Bayesian Estimation, development. 6. Characteristic Vibration Detection of Machines, development. 7. Tone Representation and Resynthesis System for Speech and Sound, R&D. 8. Noise Reduction Algorithm by Wavelet Analysis, R&D. 9. Abnormal Detection Algorithm by Machine Vibrations and Sounds, R&D. 10. Optimized Numerical Control for Semiconductor Production Device, software R&D. 11. Text-To-Speech Synthesis Program, porting and development. 12. Face Image Recognition System, algorithm R&D. 13. Visualization Software of Brain Oscillation Activities by Maximum Entropy Method, development. 14. Neural Spike Sorting Algorithm, R&D. Independent Component Analysis, technological survey and lecture. Made a survey of various methods of Independent Component Analysis, summarized mathematical theories to understand these theories, submitted as a report document, and lectured based on the report. Space Mixture Separation utilizing Time Structures. Information Theory, Mutual Information, Kullback-Leibler Information, Principal Component Analysis, Factor Analysis, Canonical Correlation Analysis, Nonlinear PCA, Kernel PCA, Cumulant Decomposition, Maximum Likelihood Method, Negentropy, Gram-Charlier Expansion, Gauss-Hermite Expansion, Edgeworth Expansion, Cornish-Fisher Expansion, Beta-Divergence, B-Robustness, Projection Pursuit, Kernel Dimension Reduction, Marcinkiewicz's Theorem, Maximum Entropy Method, Nonlinear Optimization, Eigenvalue Decomposition, Singular Value Decomposition, Symmetrical Diagonalization of Matrix, and numerical calculation methods of these theories. Change Point Detection of Time Series, technological survey. Surveyed theories and technologies of detecting change points on a given time series in some meaning and summarized as a report document. These technologies are generally called "change point detection", "anomaly detection", or "motif discovery", and many methods have been developed. The fields in need of these technologies are wide, not only signal processing but also security system, bioinformatics, multimedia processing and so on. Mainly surveyed the following methods. and wrote a report document which can be used until implementing as software program. Also surveyed concrete applied examples of Bayesian Networks to real world. Periodic Impulse Waveform Extraction, technological survey and implementation. Surveyed technologies which detect and extract periodic impulse waveform from time series data, and summarized as a report document. Also implemented five algorithm chosen from these many methods and compared accuracy and performance. Order Tracking of Machine Vibration by Bayesian Estimation, development. Developed a MATLAB program of Bayesian estimation for order tracking which estimates frequency of rotating machines or reciprocating machines from vibration and sound coming up from them. Characteristic Vibration Detection of Machines, development. Developed a MATLAB program which estimates characteristic vibration of machines from the spectrum of the vibrations. Tone Representation and Resynthesis System for Speech and Sound, R&D. This system extracts essential data structures which represents tone of sound (tone representation), and inversely reconstruct and resynthesis original tone from the data structures. Noise Reduction Algorithm by Wavelet Analysis, R&D. Developed a system which experiments and analyze reduction algorithms of noise included in speech or vibration by using wavelet analysis related techniques. Calculating sub-tree having strength more than some threshold from wavelet coefficients tree, this method reduces noise which have no relations with the essential waveform. Implemented Dyadic CART (Classification And Regression Trees) algorithm for searching optimal sub-tree. This algorithm does model regression against (sparse) binary-tree whose node has numerical value by posing penalty for complexity of the binary-tree. To develop this system, we have needed processing of complex data structure, but MATLAB is not so good at such a work, so we implemented core algorithm in C++ and let MATLAB call it as a plug-in. Abnormal Detection Algorithm by Machine Vibrations and Sounds, R&D. Researched and developed algorithms which detects abnormality of machines by vibrations and sounds originated from machines. Features are extracted which are considered to be efficient for detecting abnormality using Spectrum Analysis and Statistic Analysis. These features are input to decision algorithms of various pattern recognition. We verified effectiveness of several combinations of these features and recognition algorithms. 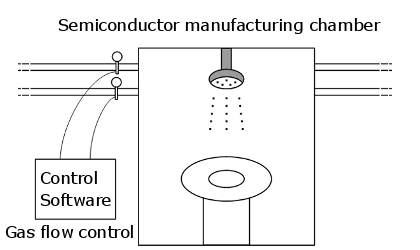 Optimized Numerical Control for Semiconductor Production Device, software R&D. Existing program which solves AR model estimation problem by numerical iteration method was very slow and cannot endure for practical use. We explored the existing program and suggested several alternative numerical calculation algorithm and implementation methods. Finally compared performance of these alternatives, we achieved 1000 times faster program than the existing program. Text-To-Speech Synthesis Program, porting and development. We ported text-to-speech synthesis program which is originally developed in CMU and Edinburg University implemented in C++ and Scheme language to lightweight C language. The original program is highly customizable software because it implements speech signal processing and various algorithms in C++ and call them through Scheme interpreter. But the original program is so large to use in real environments, and it includes redundant processing all over the place, we simplified these architectures as well as porting to lightweight C language. In C language, we not embedded Scheme interpreter, but used simple Scheme object with reference counting instead. Various inference processing used in speech synthesis are realized by Viterbi algorithm with n-gram dictionaries. We wrote Scheme program which converts pre-learned decision trees written in Scheme to decision trees written in C.
Face Image Recognition System, algorithm R&D. We developed Face Image Recognition System with cameras placed in real environments. Roughly speaking, face recognition systems are classified in two application form: "Validation" and "Identification". Validation is used for users to identify themselves in front of door access control system. Meanwhile, identification is used for estimating identity of unspecified person from candidate list in such a system as urban monitoring. 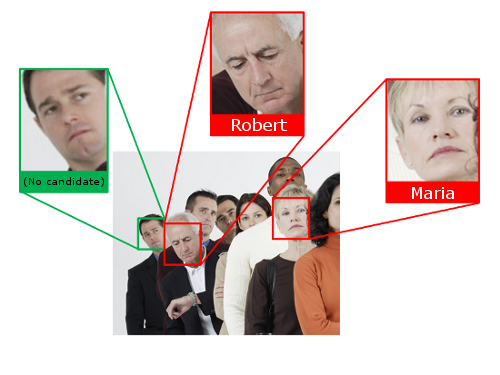 Identification results are computed based on face image of unspecified person and validation results of the face image in candidate list It is said that identification is more difficult in general than validation. For example, because of dispersion of validation scores of each person and face feature changes by disturbances, identification results sometimes contain rejection of identical person or misidentification of person. Visualization Software of Brain Oscillation Activities by Maximum Entropy Method, development. We developed the software which works out frequency analysis by Maximum Entropy Method (MEM) against data retrieved by Membrane Potential Imaging Method. To figure out oscillation phenomenon spatial-temporally which is a form of nervous activity, frequency analysis is applied to the imaging data. Since duration period of oscillation activity of brain nervous is short, and amount of time series data given during oscillation activities is small, maximum entropy method is suited for this analysis. The following processing was applied to more than ten thousands pixel data which have been output from imaging devices. * Color degradation correction of voltage sensitive dye. * Calculating power spectrum by Maximum Entropy Method. * Smoothing images by Gaussian filter. * Calculating power distribution of each frequency and drawing contour plot. * Calculating spectrogram of particular brain area. As a recording method of neural signals, it is widely worked out to record signals from multiple neurons simultaneously (as we say, population potential). 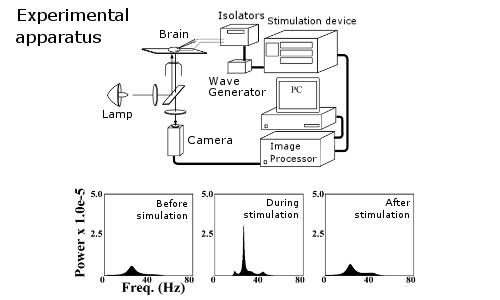 In this method, one trial of measurement is recorded as a synthesized signal of multiple neural signals. Then we need to separate each signal by extracting characteristic values of each signal from the population potential. This process is called as "Spike Sorting". 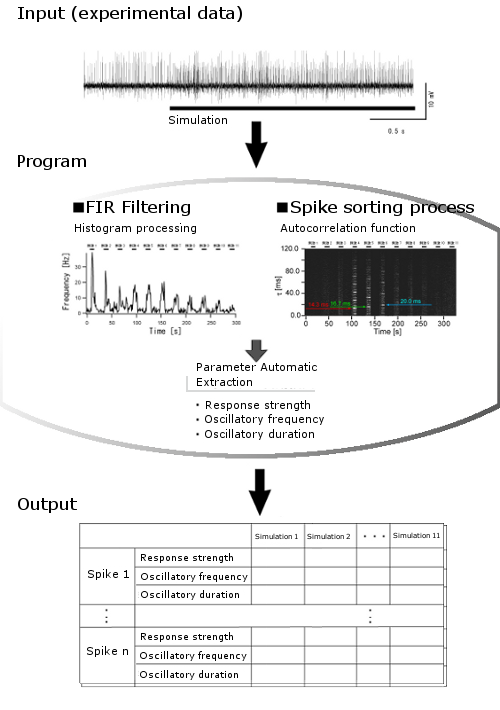 In spike sorting process, spike amplitude and duration period are typically used as characteristic values. To improve accuracy, we developed an algorithm which compares spike amplitude and shape itself. We utilized Peason's Product-Moment Correlation Coefficient for comparing spike shapes. Before calculating correlation coefficients, we applied spline interpolation against extracted spike shapes to avoid that extraction timing error of spike shapes affects correlation coefficients. With these contraptions, we have succeeded to separate more than ten spikes from one measurement record, and the extracted spikes are appeared to well correspond to the number of neuron cells suggested by the point of morphological view. We developed software which perform clustering algorithm depending on the stimulus-responsiveness of neurons against neural spike signals separated by spike sorting method from population potential. In the following example, eleven types of stimulus are exists, and evaluation items of neural responsiveness against each stimulus are existence of response, main frequency for the case of appearing some frequency response, and time variation of main frequency. Main frequency component is evaluated with self-correlation function. Response oscillation characteristics are categorized by the time variation of self-correlation function. After extracting these characteristics values automatically, these values are input to statistical software. We developed software which processes images and extract information from high-speed camera which takes pictures of insects when odor stimulation are given. In high-speed photograph, to resolve shortage of light intensity caused by short exposure time, high brightness lights are generally used. But when photographing biological objects, strong lights can not be used to eliminate affects of the lights, so the pictured images are insufficient of light intensity. We applied differential filter and extracted edges against these images, and retrieved optical flow by applying frame difference method. With this image processing, behavior occurring area of insect and its sequences become apparent clearly. 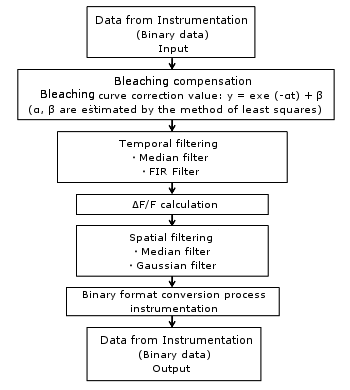 We developed software which receives input of binary output data directly from Ca2+ imaging devices and perform various processing such as color degradation correction of calcium indicator, noise filtering by digital filter, operation for relative light intensity variation, spatial noise filtering by Gaussian filter and Median filter. Processed image data are output as the format same as the binary output format from Ca2+ imaging devices, so the output can be used in combination with the software attached with the Ca2+ imaging devices.